Atlantic City is the second most popular location of brick & mortar gambling in the United States, right after mecca known as Las Vegas. After learning about this fact, it’s not much of a surprise to see that there’s an Atlantic City BlackJack game developed by worlds largest gambling software developers, MicroGaming. Dealer Peaks on all face cards (10s) and aces. If he has a natural hand (BJ), it’s instantly turned over. Played with 8 regular decks of 52 cards. Double Down on any two cards allowed & double down after splitting possible. Hands can be split times, making up to 4 hands. Aces can only be split one time. If you split aces and get a face card dealt, it counts as 21, not BlackJack. 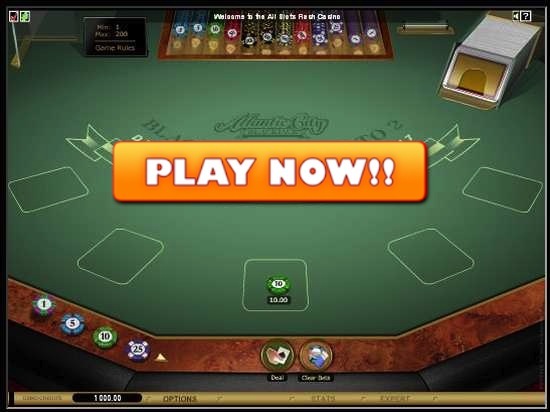 MicroGaming are developers of the Atlantic City variation of this game, thus casino sites powered by this software company are also the best place to play it online. This doesn’t only account for this particular type. I would say that MG has the best offerings for BlackJack players. If you are not a US resident, don’t wait up – join either of the two casinos listed below! Royal Vegas is an industry oldtimer and has actually been around from the time it really started to grow. Launched in 2000, they are still in the business up to this day and among the most trusted & respected gambling brands out there. If you’re a new player, there hasn’t been a better time to join Royal Vegas Casino, as they currently offer a welcome package of $1,200 on your first three deposits! Play Now – $1,200 Welcome Bonus! Jackpot City Casino is another great option, for players of this game and specific variation. Launched in 1998, they are celebrating 15 years of succesful work in 2013. I think that says it all about the reputation and gaming experience you’ll get playing at this brand. As a new player, you’ll be rewarded with a $500 welcome bonus that is divided into two tiers, which allows all players, even those with relatively small depositing budget, to claim the full bonus offer. $500 Atlantic City BJ Bonus – Click Here!